Six Sigma is rapidly becoming the strategy to bring significant improvements in quality, market share, profit margins and costs reduction. 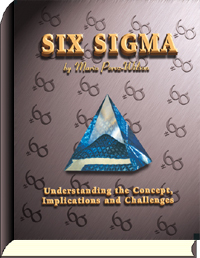 To clarify the understanding of the role of Six Sigma in your organization, let Mario Perez-Wilson crystallize the vision of Six Sigma. "In the late 1980's and early 1990's, Motorola pioneered the Six Sigma initiative and in the process reduced the number of defects in its products from 4 to 5.5 sigma, yielding $2.2 billion in savings." While he was in charge of the Statistical Methods Department at Motorola from 1987-1991, Mr. Perez-Wilson developed the standard methodology for achieving and sustaining Six Sigma. Participants will benefit from lessons learned by Mr. Perez-Wilson throughout seven years of hands-on implementation of Motorola's Corporate-wide Six Sigma initiative and thirteen years as an independent consultant. This Executive Overview presents the importance of reducing variation, defects and errors in all the processes throughout an organization in order to improve the overall performance of the organization. Strong emphasis is placed on explaining the breakthrough strategy and implementation of the methodology to achieve and sustain Six Sigma. "GE Chairman Jack Welch has indicated that Six Sigma may add $8 billion to $12 billion savings in five years, if utilized successfully." Executives will develop an excellent understanding of how variation, defects, errors and mistake reduction affect product, process and service quality, performance, productivity and costs. Finally, Mr. Perez-Wilson will present the essential elements necessary to deploy a successful Six Sigma effort throughout the organization. This session is exclusively for the Executive Leaders of the Organization. coach you and take you through implementation from beginning to end.